← How about a BC / Ontario Wine Summit? This past week the Naramata Bench wineries had their “Simply Red” tasting. And you guessed it, red wines only! The red wines from this stretch of land, just north of Penticton on the east side of the lake produce some very nice red and white wines. If you ever go for a wine tour in the Okanagan, the wineries along this stretch of the Naramata Bench are quite close together, so it is easy to do several wineries in one day. Plus if you would rather not drive your car, it is an easy bicycle ride. The red wines for this tasting were primarily the 2008 vintage, although there were a few 2007 also. Some of the wines were bottled a few weeks before this event. I did not notice any bottle shock though. All the wines I tasted were all technically made well. I usually like to try Pinot Noirs first as they are the lightest bodied wines, then taste Merlots, Syrahs, and Cabernets. There were three pinot noirs that I particularly liked: La Frenz Reserve Pinot Noir 2008, Lake Breeze Seven Poplars Pinot Noir 2008, and Nicol Vineyard Pinot Noir 2008. The La Frenz Reserve Pinot Noir 2008 (and their other wines) was top notch. This wine won a Silver in the Northwest Wine Summit this year, and two Gold medals at the Northwest Wine Summit in 2009. It had a nice smoky, strawberry nose with a hint of oak. Light body with strawberry and cherry flavours. Silky with low tannins. Long length with a cherry finish. Buy it before it is all sold out. Lake Breeze is also a premium producer of wines in the Okanagan. They are most well known for their Pinot Blanc, but they also make very good red wines. The Lake Breeze Seven Poplars Pinot Noir 2008, was light cherry in colour. Vanilla and strawberry aromas. A very nice nose. On the palate it was medium bodied, with strawberries, raspberries and cherry flavours. Quite spicy. Well done. The Nicol Vineyard Pinot Noir 2008 had gone through a partial malolactic fermentation (MLF) to change the harsher malic acids in the wine to softer lactic acids. Many red wines go through this secondary fermentation to soften them up. This wine was very pale cherry colour in the glass. A really nice red cherry and vanilla nose. Light body, with bright cherry flavours in your mouth. Slightly spicy with some vanilla notes too. Dry with low tannins. A classic style New World Pinot Noir. As I mentioned earlier, Lake Breeze makes wonderful wines. Case in point is their Merlot. The Lake Breeze Seven Poplars Merlot 2008 is medium garnet in colour. Vanilla, plum, with a slight bit of capsicum and mocha on the nose. Full bodied mouthfeel, with black and red cherries, vanilla, and a bit of minerality. Soft tannins with a medium length. 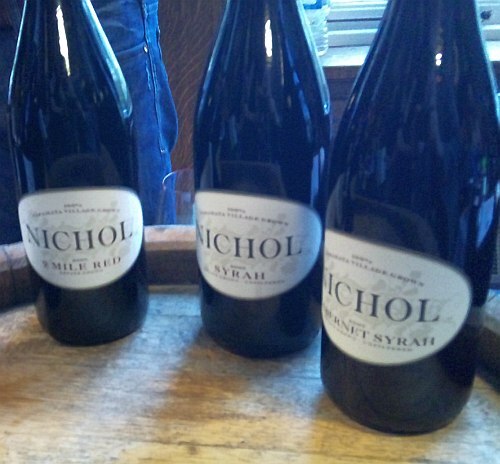 The Nicol Vineyards Syrah 2008 is opaque purple in the glass. Vanilla and sweet dark fruit nose. Raspberries, red cherries, blueberries and a bit of minerality on the palate. Soft tannins. I do enjoy a syrah when the blueberry characteristic of the grape is detectable. 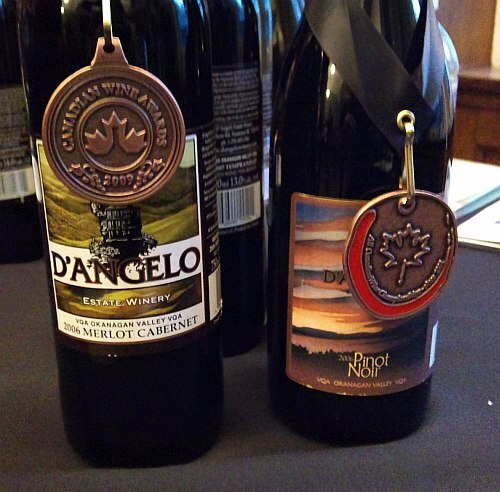 The La Frenz Rockyfeller Vineyard Shiraz 2008 won a Gold medal at the All Canadian Wine Championships 2010. This is a very elegant wine. Deep garnet in colour. Blueberry, raspberry and vanilla aromas. Medium body and mouthfeel. Cherry and vanilla flavours. The D’Angelo Sette Coppa 2005 I think is the oldest vintage wine during this tasting. The Sette Coppa 2005 won a Silver medal at the 2008 Canadian Wine Awards. This is a blend of Cabernet Sauvignon, Cabernet Franc, Merlot, Petite Verdot, and Malbec. It is primarily Cabernet Franc and Merlot, with lesser amounts of the other grape varieties. Light garnet in the glass. Tarry, cassis and black cherry aromas. Cassis, cherry, chocolate and vanilla on the palate with some spiciness. Medium length with firm tannins kicking in on the finish. Enjoy with some grilled meat. I hope you have a chance to enjoy a few of these picks from the Simply Red Naramata Bench tasting. Enjoy! This entry was posted in BC, naramata bench, wine and tagged BC, D'Angelo, La Frenz, Lake Breeze, merlot, naramata bench, Nicol Vineyards, pinot noir, simply red, syrah, wine, wine tasting. Bookmark the permalink.